A character study of a concerned family man sliding into the abyss of paranoid schizophrenia, Take Shelter is a low-key phantasmagoria of internal demons and waking nightmares. It's psychological horror bereft of any supernatural exaggeration. It's simply not necessary. Few things are scarier than being acutely aware that you are losing your grip on reality. Such is the situation facing stone-faced Michael Shannon, a taciturn construction worker and doting father who is convinced that a calamitous storm is about to beset his sleepy Ohio village. To protect his loved ones, he begins digging out a tornado shelter in his backyard, a practical eccentricity that begins with Life magazine images of jumbo Campbell's soup cans but quickly morphs into an obsessive brand of survivalism. 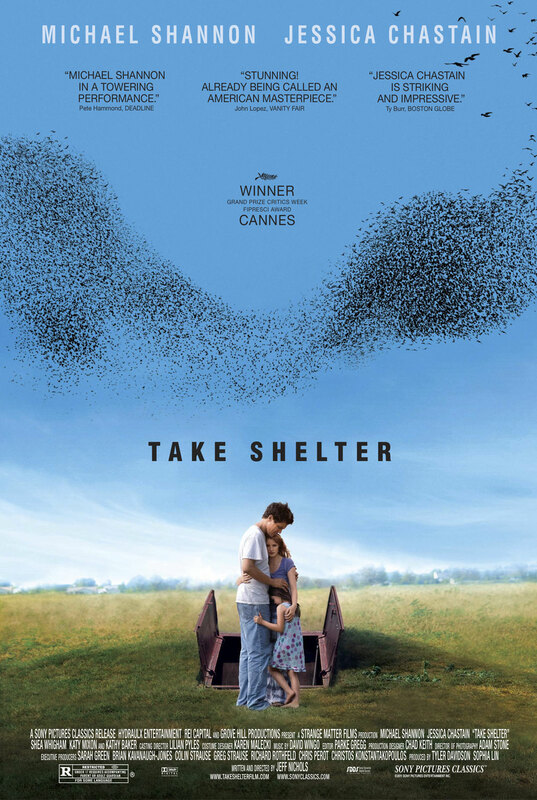 Approaching the topic of mental illness in an artful way, Take Shelter has two major advantages. One is its detailed and disarming portrait of suburban solitude. Nichols takes his time establishing the rhythms of domestic life, following Shannon and wife Jessica Chastain to Saturday swap meets and Sunday dinner and sign language classes taken for the benefit of their daughter, born deaf but holding out hope for a cochlear implant. The other is Shannon's masterful performance as a crumbling pillar of mental, social, and financial stability. He does not ride the bullet train into madness. He digs himself into it, dirt clod by dirt clod. "I need to do something normal," Chastain pleads with Shannon after a low point in their increasingly trying relationship; what's surprising about Take Shelter is how "normal" life really seems despite all the forces arrayed against it. Families are families, whether or not daddy can't stop tearing up the backyard with a borrowed backhoe. For all of its natural ease, though, the film stumbles with its symbolism. The script mixes its biblical metaphors - Shannon is Job! No, wait, now he's Noah! It's a risky proposition and would have failed in the hands of a lesser actor. Take Shelter also goes for some easy scares in its vivid nightmare sequences that build to its main character's breaking point. It's a tactic the movie hardly needs. Shannon in full froth is scary enough, propelling Take Shelter into a place past conspicuous insanity or hallucination into a realm that is recognizably, terrifyingly human. Hi! The web site loading speed is incredible. It kind of feels that you’re doing any distinctive trick. Emergency Dental Houston Emergency Dental Houston, Call now 832-786-4406 We charge normal rates even on emergency cases,This is due to the fact that we care about our Texas Clients.